Day 214: Throwing Down the Guantlet . . . So, have you ever had one of those days when someone whom you admire and respect just puts a challenge out there that you just can’t back down from? You know, one of those “double dog dare you” kind of challenges . . . or maybe even a “triple dog dare you”. Wow – that’s a “Christmas Story – stick your tongue to the light pole” kind of challenge. Ya see, Jean is in Houston for a conference with all her Catholic school cronies while Brian is holding down the home front with all three “girls” – and tonight battling a storm that while much-needed and appreciated does wreak a bit of havoc with the four-legged children. Rain is a good thing – so no real complaints – but unsettled dogs . . . not so much – gonna be a long night at Casa del Vino. Ok, ok, Brian gets the sympathy vote – since Jean is enjoying a king size bed and no dogs. So, back to the challenge – as it turns out, Jean’s buddy Leah – tossed one out there tonight . . . who is the better writer – Jean or Brian. Truth be told, you never really know who is writing each night – sometimes one get inspired to write about the days happenings or the other says “Ok, I’ll do it” – every night is basically a toss-up. Well tonight, Jean took the rudder and decided to sail the this puppy home. Along with culinary delights came the blog wine for tonight . 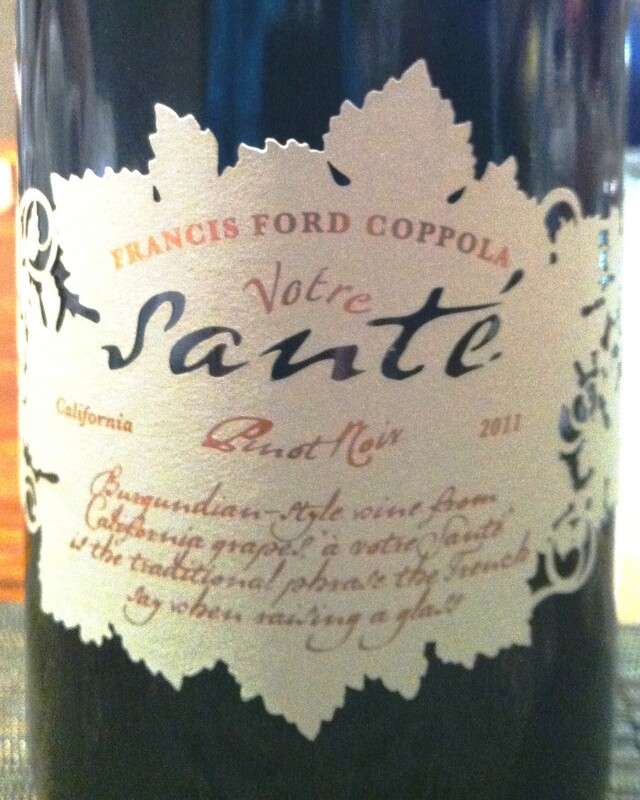 . . a 2011 Pinot Noir – Votre Sante from our good friends at Frances Ford Coppola ‘s winery in California. On the nose, this wine has a bit of lavender chased by some cherry – of the dark fruit variety. As for the palate – well, Katy bar the door . . . you’ve got a compliment of raspberries and pomegranate with hints of sandalwood (which for the record is like one of Jean’s all time favorite scents – especially when joined at the hip with vanilla). All these combinations come together to create a really super little wine. Not too sure of the cost, but gotta tell you – this one is like a redfish caught on a sunny day off the coast – a keeper! Gonna have to check out the website and find out where to pick some of this up! If you find – let us know . . .
Wine, like most things is always better when enjoyed with good friends and great food. Thanks to the wonderful folks at Mind Streams for a meal to beat the band. 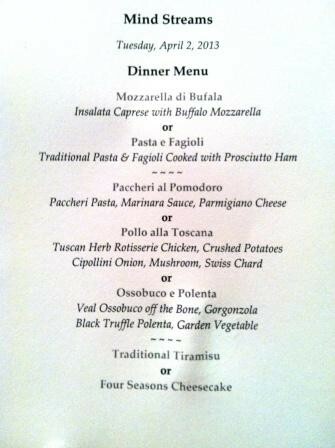 Just have to post the menu . . . take a gander and drool! Yes, it was as wonderful as it looks! So, one could ramble on for hours about how wonderful the food was and the company, and the wine and the rain that arrived tonight – or one could seriously try to overshadow the previous night’s blog and try to come up with a plethora of whimsical sayings and perhaps even a movie quote or two – but, alas poor Yorick (I knew him, Horatio), perhaps it’s best to know when to turn out the lights, the party’s over and call it a night. Leah, the ball is in your court – win, lose or draw – still think you are top drawer!